The conferences’ talent imbalance has never been this lopsided before. Paul George (left) and Jimmy Butler are two very good players who won’t be in the Eastern Conference next season. When you stop and sort through the biggest NBA headlines of the past week and a half — Jimmy Butler being traded to the Timberwolves, Chris Paul becoming a Houston Rocket, Oklahoma City shocking the league by picking up Paul George, and now four-time All-Star Paul Millsap joining the increasingly fun Denver Nuggets — you might notice a trend. The best players are all either going to or staying in the Western Conference. Nearly a quarter of last season’s Eastern Conference All-Star roster has gone west this offseason1 while no 2017 Western All-Stars have gone east, at least so far. In a way, LeBron James is to blame: He has bludgeoned his Eastern Conference competition so badly in the past seven years that several of those franchises have given up on competing with him in the near future and begun teardowns.2 The Eastern conference as a whole won just 45 percent of its contests against the West last season (a 37-win pace over 82 games), and things can only get worse from here. This could very well be the biggest top-end talent disparity we’ve seen between the conferences since the NBA-ABA merger took place before the 1976-77 season. Depending on whether Utah free agent Gordon Hayward moves to an Eastern team, either 22 or 23 of the top 30 players going into next season will be in the West.3 Hayward is choosing between the Miami Heat, Boston Celtics and Utah Jazz, who this past season made their first playoff appearance since 2012. But even if Hayward signs with Boston or Miami, the East will still only be home to eight of the league’s top 30 players next season, the lowest total for a conference in the modern era. 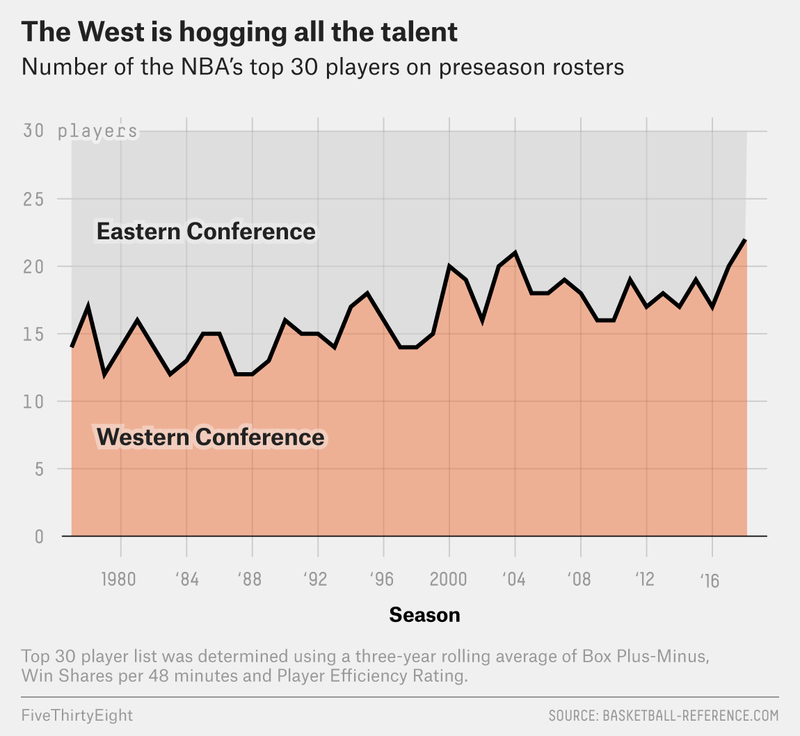 Likewise, the West would eclipse the previous high-water mark of 21 top-30 players, which was set before the 2003-04 season — in which the West had six 50-win teams, while the East had just two. We ranked the NBA’s best players by calculating a three-year rolling average of each player’s key value metrics: Box Plus/Minus, Win Shares per 48 minutes and Player Efficiency Rating.4 After isolating the top 30 players (including ties) after each season, we tracked how many were in each conference just before the start of the following season. As problematic as the imbalance might be in this coming season — a season that a lot of eastern clubs may decide to punt on, given how easily the Cavs figure to win the conference — the issue seemingly stems from the way these clubs perform in the draft. A quick look at the top 20 players from last season, for instance, reveals that 17 of them began their careers with teams out west — James, Butler and Kyrie Irving are the lone exceptions. There are other, nonsystemic reasons that the East has less top talent than it should. Two of the biggest are Derrick Rose’s history of injuries, which changed the trajectory of his career before he reached what should have been his physical prime, and the career-threatening health condition that has indefinitely sidelined Chris Bosh, who was one of the league’s most well-rounded players even while playing third fiddle to James and Dwyane Wade in Miami. We don’t yet know how the season will play out. But if this summer is any indication, we shouldn’t expect all that much noise from the Eastern Conference during the 2017-18 campaign. The league can only cross its fingers and hope that LeBron, who will be a free agent in 2018, doesn’t decide to join the party out west. If he does, we might see nothing but tumbleweeds east of the Mississippi. Carmelo Anthony, who is now reportedly willing to waive his no-trade clause if the Knicks make a deal that would send him to the Rockets or Cavaliers, could push that number as high as 31 percent if he ends up with Houston. The Bulls had the youngest MVP in NBA history, owned the best record in the NBA during the 2010-11 season, and tied for the league’s best mark in 2011-12, but they never managed to get past LeBron. One season after losing in seven games to James and the Heat in the Eastern Conference finals, the Pacers got the No. 1 seed in the East in 2013-14, but faltered and never rose to that level again. And the Hawks won 60 games — most in the Eastern Conference — just two years ago, but now none of the starters from that club remain on their roster. Golden State’s Kevin Durant and San Antonio’s Pau Gasol, who both finished in the top 30, are technically free agents who have yet to reach new deals with their respective teams, but it’s widely assumed that each of them will stay with their current club, so we’re counting them as West players for next season. We picked those three statistics because all are commonly used and available at Basketball-Reference.com. Each player was ranked in each stat — among players who’d logged at least 3,500 total minutes over the previous three seasons — and the three ranks were added together to get a consensus ranking of the top players in the league.